← Not Feeling Black Friday! Buckle up, Peeps, it’s about to get busy! Having Thanksgiving so early this year got me in a tizzy about Christmas. Then I looked at the calendar and it’s all good; procrastination for another ten days or so, and then PANIC! I have quite a few presents bought, but that’s only the opening salvo. They have to be wrapped and shipped since my whole family, on both sides, lives several states away. USPS flat-rate boxes are life savers. I could save a whole bunch of aggravation and just give everyone a gift card, but that’s only for true emergencies like that impossibly picky person who we all have to buy a present for. I’m too old to run all over town looking for the “perfect” gift. Merry Christmas; buy your own damn gift or stop being so picky. Well, now that that’s off my chest, and this isn’t even a Christmas post. We’ll probably start up next week, so this is the calm before the storm of bad holiday finds. We look for Christmas fodder all year long—just for you! I titled this one: R.B.G.’s D.O.G. I absolutely adore Ruth Bader Ginsburg and her iconic look. 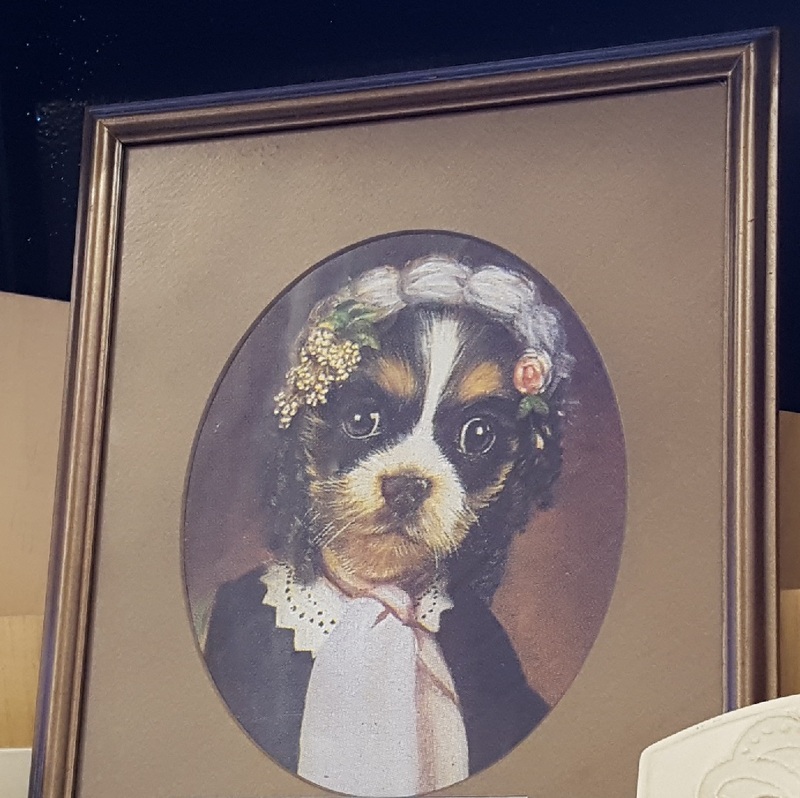 If, she had a dog, I hope she would dress it this way. In the meantime, I can dream. 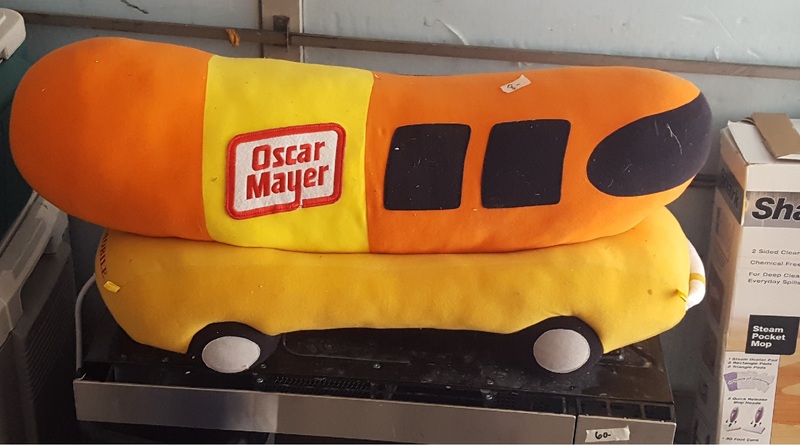 I cannot help it; whenever I see the Weinermobile I have to sing the Oscar Mayer song (I’m so sorry for the earworm) which is very annoying to all around me. 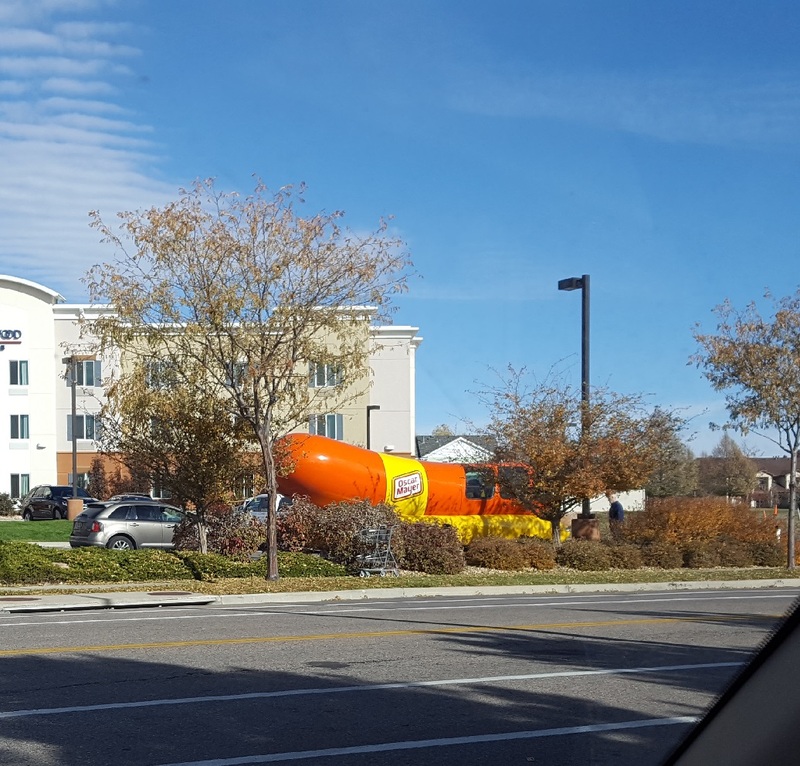 I love seeing the big hot dog driving on the expressway; a very surreal experience. You really have to be a fan to keep a big old stuffed toy around. It’s sitting on top of a microwave for some scale. These crazy people thought it was worth $8, and there it sat. It might make a good dog toy, for a bigger dog than my little guy. We feel bad about making fun of homemade projects, but when things are this bad, all bets are off. They weren’t very cute to begin with and the paint job isn’t doing them any favors. That poor little thing with brown hair and burning eyes is absolutely terrifying. I think she is pissed about how she is dressed and who can blame her? 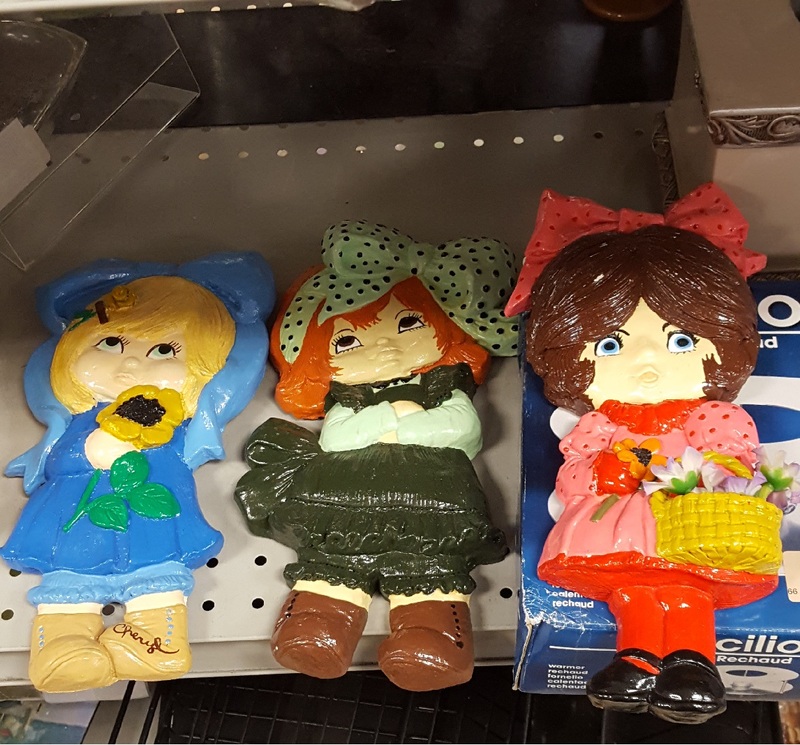 Also, is there some rule about whenever there are three little girls, they must have blonde, brunette, and Titian hair? Those little Charmin girl prints, and the Powerpuff Girls leap to mind. Why not three brunettes? they are horrible and useless! 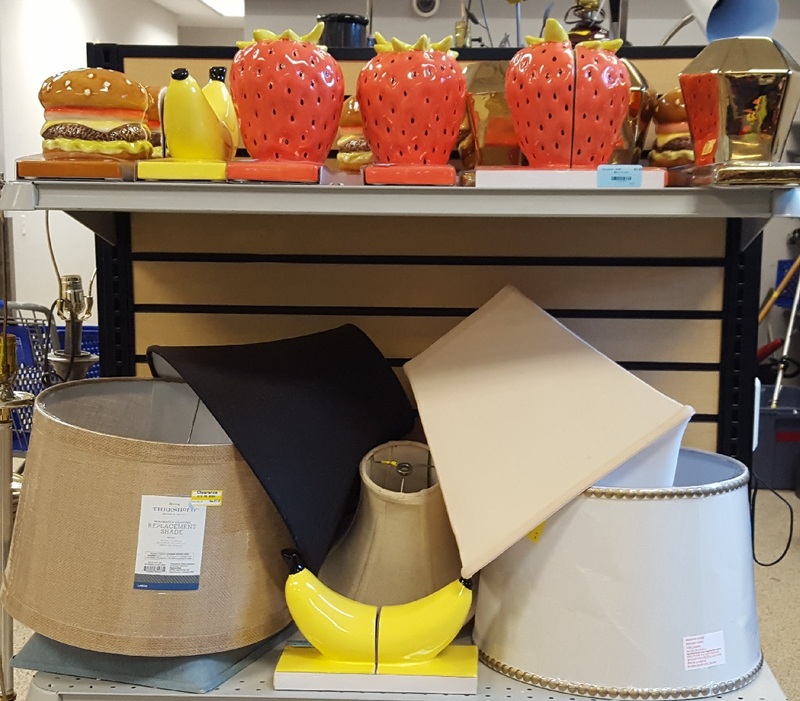 One of the strawberries, and a banana appear to be divided, but the base is still one piece, so they can’t be bookends. All those lamp necks are from lamps behind them. That leaves just big, food-oriented, ceramic thingies. I can see why they were remaindered from a local retail store. Ugh! 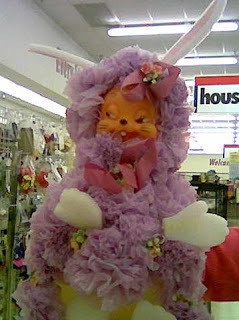 Kathy adores cats, but she gave this a pass. 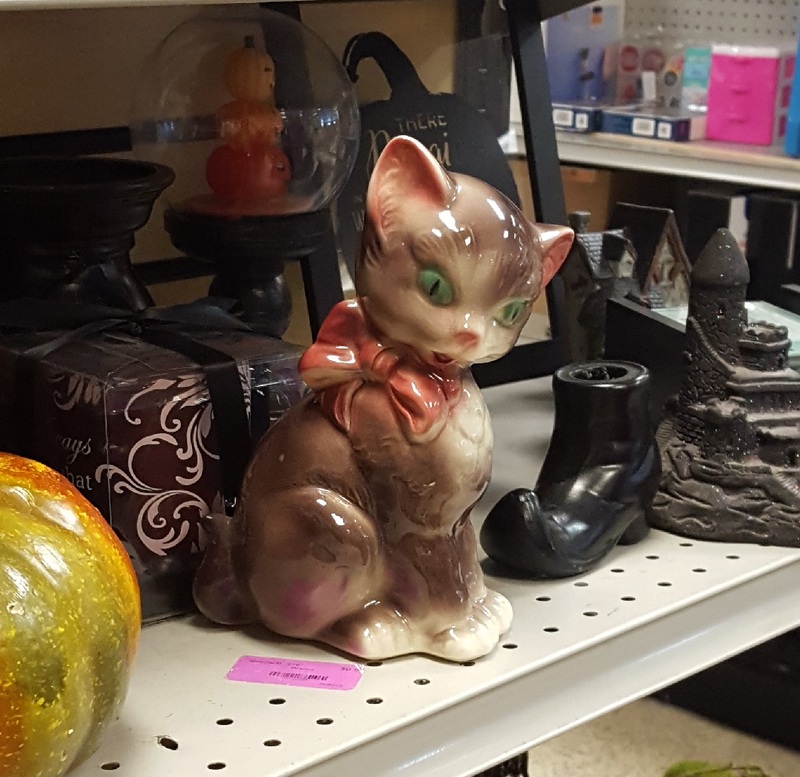 It kind of looks like Miss Kitty is seeing something unseemly over on the opposite shelf. Those are some wide-open shocked eyes. We should have turned her around to spare her some trauma. I always feel sorry for figurines that live in the bathroom. Just imagine what they have to put up with! Boy, this would make housekeeping a lot more fun. Thinking about having a drink after getting the bathrooms scrubbed suddenly makes cleaning day just a little better. Thank you, napkin, for the great idea. 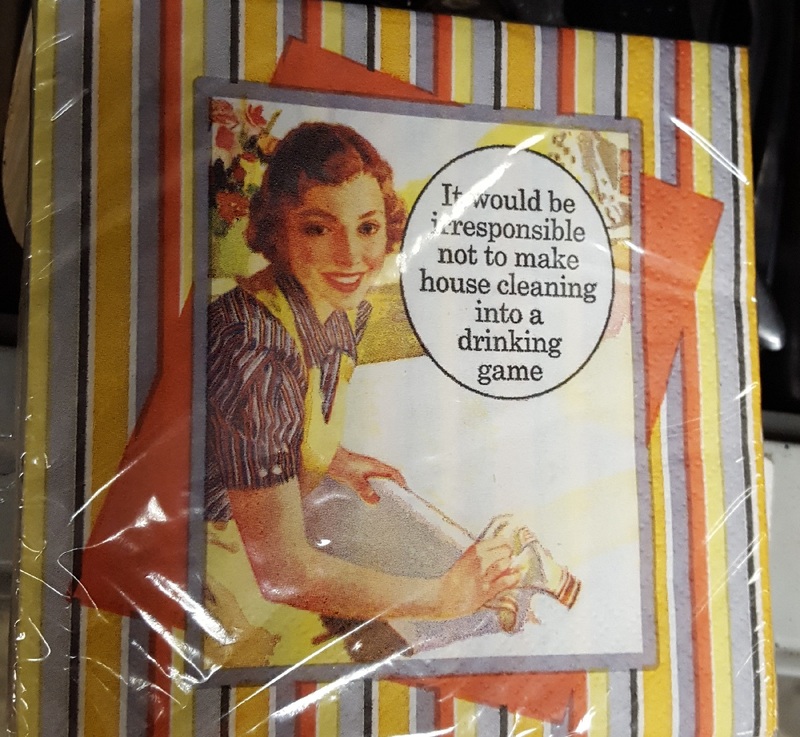 In fact, drinking games would make the most tedious job suddenly rewarding. I might even enjoy doing my income taxes, or polishing silverware if I drink a G & T at the same time. Hmmm. 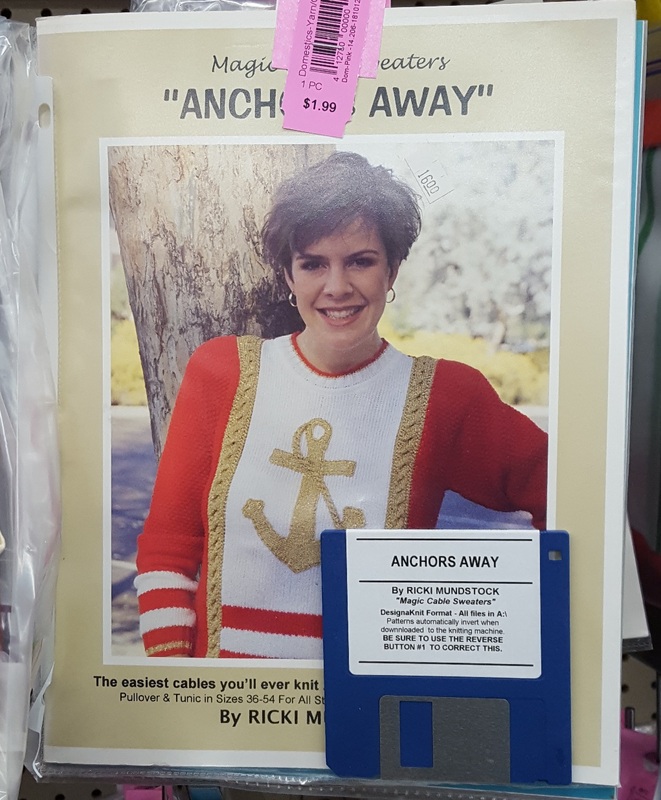 I’m sure someone from Dynasty (1981) would wear this sweater to lunch, especially if the luncheon were on a yacht. The original kit owner showed restraint and good taste by never breaking that disk out of the package and actually knitting this eyesore. We almost bought this to rescue those poor little chickens about to be crushed by that big horrible basket. 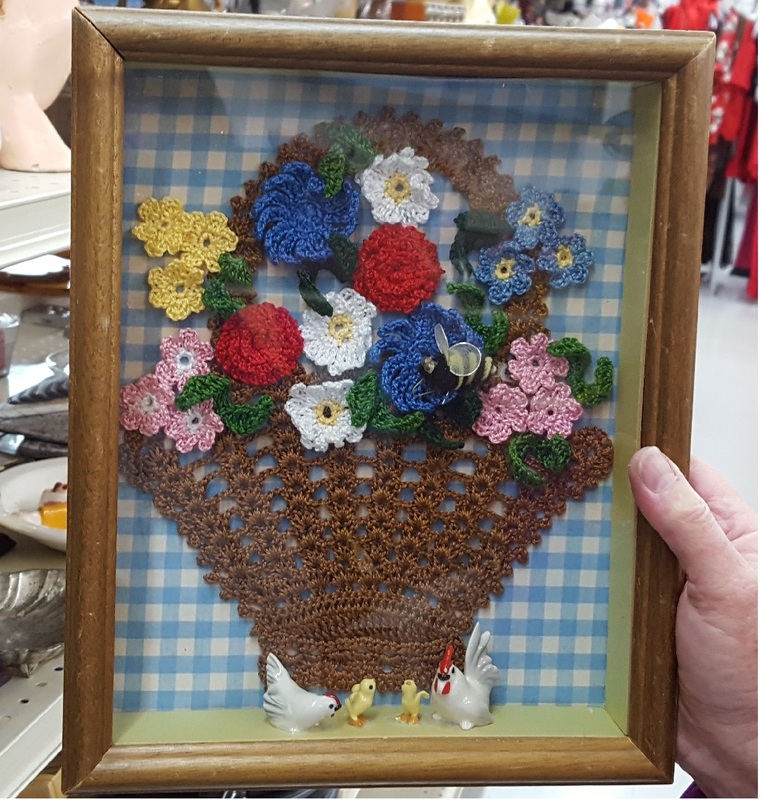 To be honest, the flowers aren’t all that bad; you wouldn’t be shocked to see this in your elderly auntie’s house, especially if she can’t see well and likes to crochet. But, what in the hell are those tiny chickens doing in this mess? The maker must have decided that the picture just needed something else and threw that flock in there. Next time, put the chickens down and attach a few more fabric bees until the emptiness leaves your soul. We like this plate. 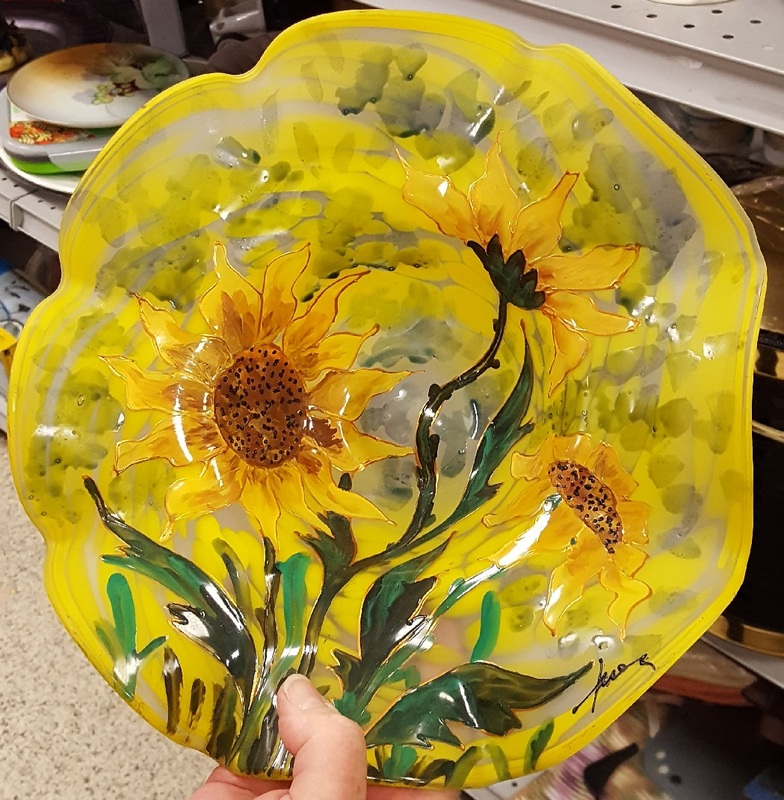 It looks like Vincent van Gogh took up ceramics decoration and painted some sunflowers. It’s so happy and cheerful, but doesn’t cross over to blindingly bright. It’s a fine line, but this plate is on the right side of it. If this were in my kitchen, it would make me smile every day. And, that dress is quite something. She has the most flirtatious look on her face, which isn’t easy to do with a doll. We both wished she wasn’t so huge, and expensive. She obviously needs a home, but we stay away from the big girls. Whoever made her was pretty skilled because there isn’t anything cheap about that dress. The fabric was scrumptious. I even like her wig. She looks like she could have danced the night away in the mid to late 1700s. 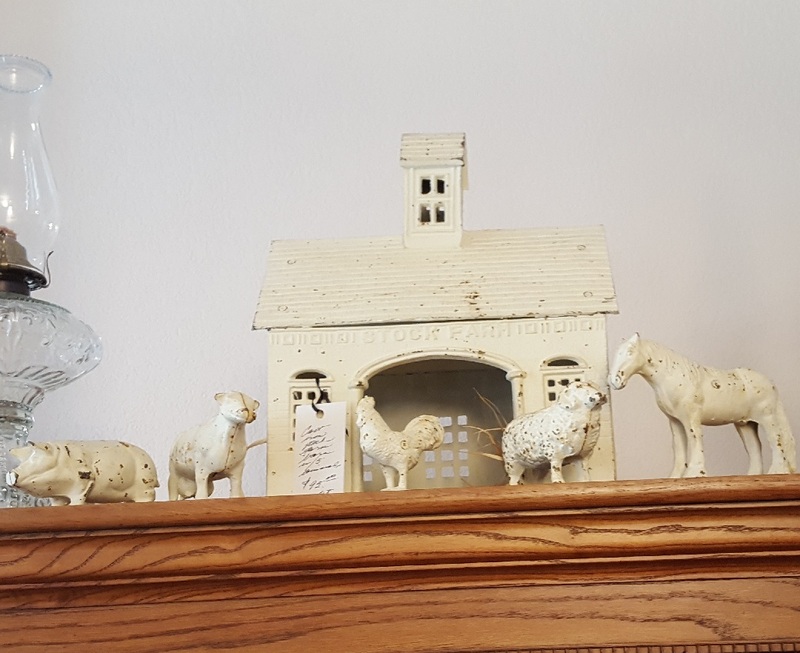 Is this a kid’s barnyard set? 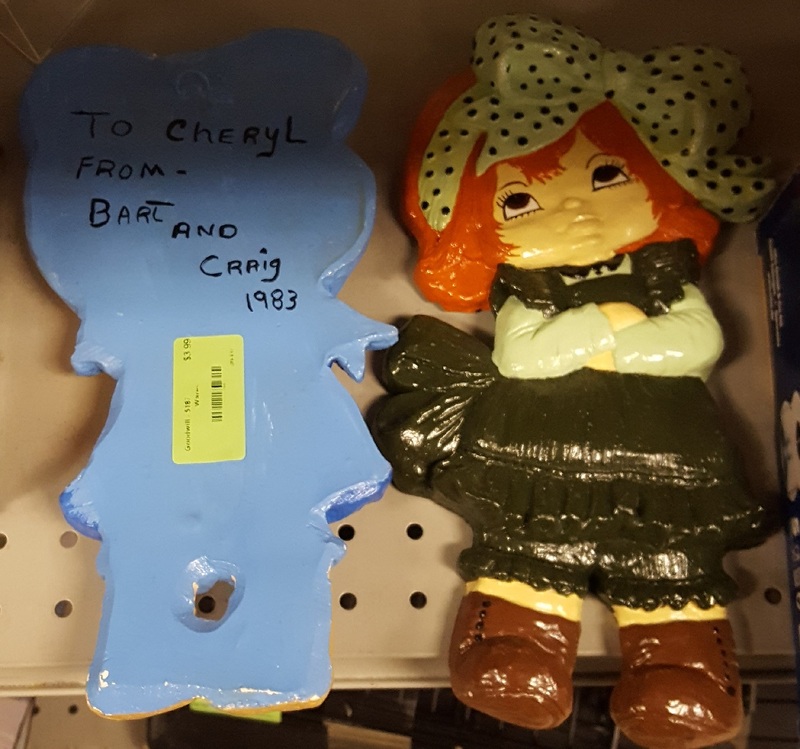 When I think of cast iron toys, what comes to mind are banks, vehicles, and play stoves. I don’t think that I have ever seen anything like this. It would be quite hard to play with being all iron-y and heavy. A kid would have lots more fun with a wooden set, or maybe tin lithography, than this immovable object. On the other hand, it would be nearly indestructible, which is a bonus. I’m not liking the whiteness of it all. I hope it had fun and bright paint when kids were playing with it. Thanks for reading. It’s best to just take a deep breath and plunge into the holidays. Be sure to stop by for a laugh or two; it’s medicinal! 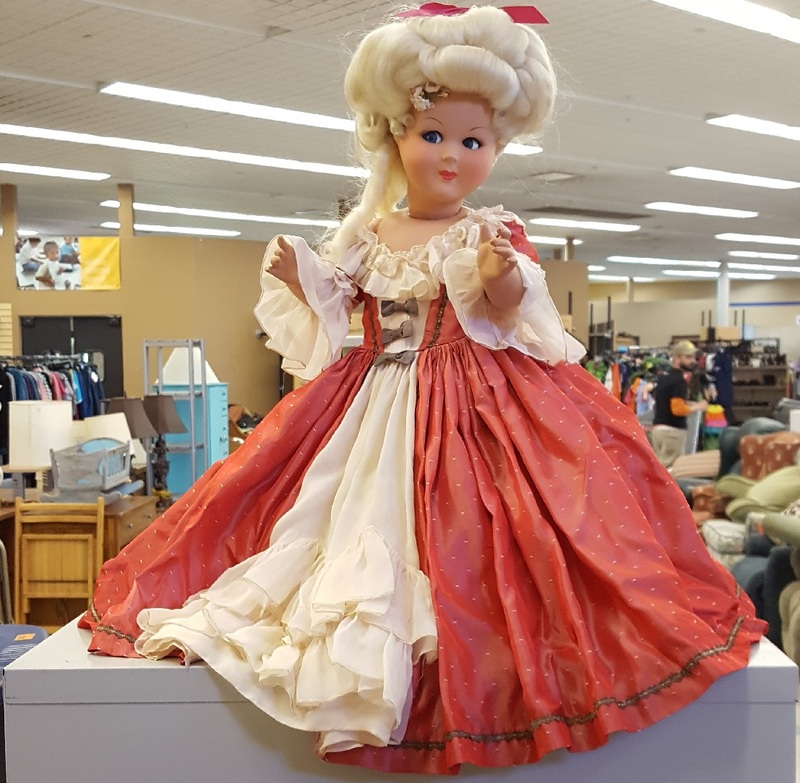 This entry was posted in Friday Finds and tagged Bad Decor, Cats, Crafts Gone Wrong, Dogs, Dolls, Estate Sale, Pictures, Thrift Store, Vintage, Vintage Clothing, Yarn Play. Bookmark the permalink. Thanks Sandi! We had a pretty good line up this week which is half the battle.